The frustration with Stick It To Ya is how much better it could have been as an album, had the bloated track list been trimmed. Adding Loaded Gun to the first eight tracks and releasing a nine-song set would have resulted in a much more highly regarded album. As it stands, the album is a good one third longer than it needs to be, and the back-end is padded with forgettable and sometimes outright poor tracks like That's Not Enough, You Are The One, and Gave Me Your Heart. And the acoustic version of Fly To The Angels, sucking the power out of a power ballad, is also an unnecessary addition. 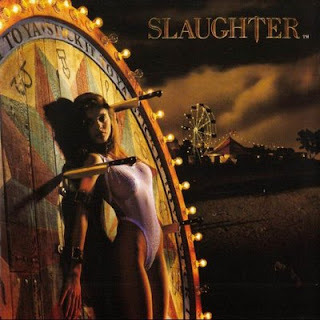 Arriving really late to the glam metal party, Slaughter, from Las Vegas, was formed from the ashes of the Vinnie Vincent Invasion, and released Stick It To Ya as their debut. It was to remain their most commercially successful release. The good parts of the album tend to be the more up-tempo tracks, mixing the best elements of Bon Jovi-type anthems with some confident and surprisingly edgy energy to deliver songs like Eye To Eye, Up All Night, Mad About You and Loaded Gun. The late Tim Kelly on guitar drives these tracks, never pretending to be a great soloist, but making up with dedication and commitment what he lacks in talent. Mark Slaughter's raspy, higher-pitched vocals are pleasingly distinctive, while Blas Elias on drums and Dana Strum on the bass provide a thumping foundation to build on. And a special mention of the album cover, with artwork by Glen Wexler and Hugh Syme that is moodier and more distinctive than most metal fare. A case study in why it's useful to leave'em wanting more, Stick It To Ya contains many memorable moments, and in its overgrown state, just as many regrettable ones. Produced by Dana Strum and Mark Slaughter. Engineered by Andy Chappel. Mastered by Bob Ludwig.